Futurism Investigates: How Much Wood Could A Woodchuck Chuck? We are finally going to tackle the famous question, “how much wood could a woodchuck chuck if a woodchuck could chuck wood?” And we’ll do it using science! 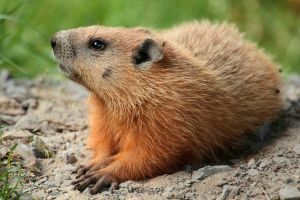 The woodchuck (Marmota monax), more commonly known as “the groundhog,” is a tiny rodent. A typical woodchuck is about 14 pounds (5.8kg) and 32 inches long (81cm). Considering their small size, woodchucks eat an exorbitant amount of food: a single woodchuck can eat a 100-foot Redwood tree in about 35 seconds. Woodchucks don’t actually eat wood. Instead, they eat grasses, clovers, black cherry, honeysuckle, snails, insects, baby birds, eggs — pretty much everything else they can get their hands on. But not wood. Of course, they can “chew” wood, but that’s not really saying much, as anything with teeth can chew wood. If a woodchuck were brought to the brink of starvation, it may attempt to eat wood as a last resort. But a woodchuck can’t digest wood, so things probably wouldn’t end too well…and since this poor rodent would be half starved, I’m guessing the woodchuck wouldn’t chew very much wood. Likewise, if a woodchuck could chuck wood (as in, “throw wood”), the wood wouldn’t be chucked very far, as they have tiny ineffectual fists. But let’s get to the real matter at hand: How much wood can a woodchuck chuck (aka mash apart into tiny bits) ? Another study found that woodchucks can get through about 361.9237001 cubic centimeters of wood per day (though that may not be the most reliable research).